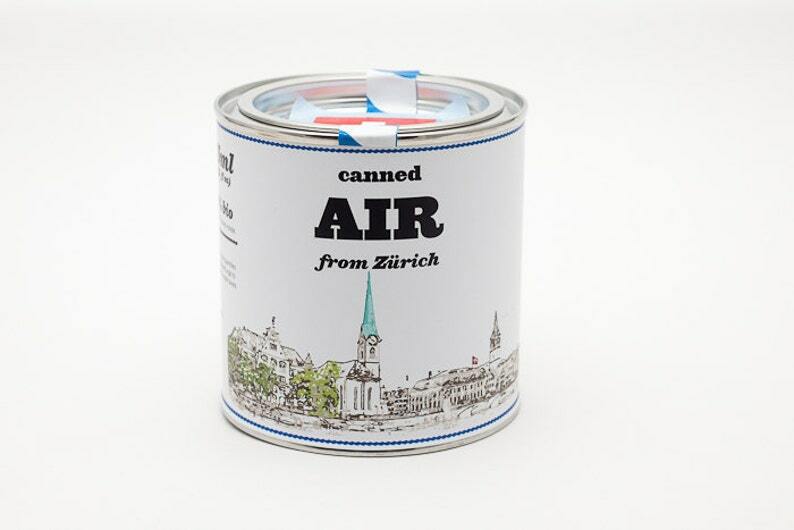 Canned Air from Zürich is a middle-sized empty can, a gag souvenir with witty texts and images printed on it. The can is 88 mm (3,46 in) high and 86mm (3,38 in) in diameter. *consumption in large quantities can cause unexplained urge to launder money and evade taxes. *strong smell of money inside. *this can is better preserved in a guarded vault. Get yourself a piece of the city to remember. Feeling down? Got the blues? Buy a whole box of Air and open the cans whenever you feel sad, remember the atmosphere, marvelous time you spent in Zurich and feel better. Never been to Zürich? Order your can online and begin your journey while still at home! The Air of Zurich is also a great gift for your friends and family. Forget the magnets, cups and plates. Bring home something everybody will love and ask questions about. Exactly as described, by husband loved this! Shipping takes a while, but packaged nicely!